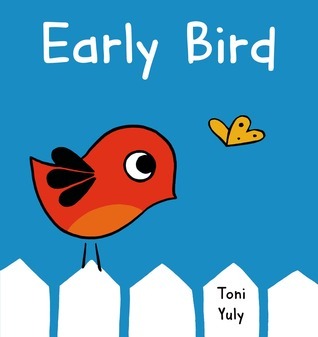 This is Toni Yuly’s first picture book. It is a very simple story for preschool readers with a funny and heartwarming twist at the end. Early Bird gets up early. She hurries on her way to find the Early Worm. After her long journey, picks him up with her beak and lays him across the top of a big ripe strawberry so they can have breakfast together! The story and the illustrations are pure and clean. Bright colors follow the Early Bird as she begins her day, and lead the reader into a wonderful expression of friendship. Toni Yuly is an artist who must have the heart of a child. I hope to see more of her work to share with my grandchildren. Very colorful and simple. Pefect for young children.